It was scheduled to run from 22nd - 26th September, and everything went on religiously as earlier planned. 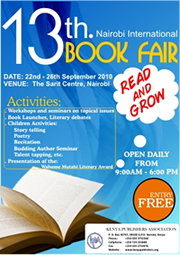 The Nairobi's Westlands Sarit Centre was pregnant with stands for different publishers, presses and publishing houses who'd come to exhibit their books and other works apart from using it as a marketing leeway. I was appalled by the unprecedented stands that crowded the whole of the 1st Floor with masses of humanity from almost all over the world stomped around. It was a spectacular event and I being one of those who'd attended the Fair did enjoy it. Notably of those present were the Yambeka Children, a child media company that had been publicized by Social Media PR on social Media websites like facebook and Twitter, blogger,friendfeed and googlebuzz for quite some time. Social Media PR was imploring parents to come out with their kids to the Fair for it caters for all generations and ages thus children are no exception from such a nurturing event where the culture of reading to grow is emphasized. "Parents there is nothing good as giving your kid an early read in their lives, in fact kids recognize objects and bright colors before they can start to identify the alphabet, you will see that with this flashy hard covered books with Yambeka Children will add a lot of value in getting your kids mind prepared to head into the future." or so went the plea to parents on the Yambeka Children Media blog. Yambeka Children Media was founded in Columbus Ohio (USA) by Helvi Itenge-Wheeler a Namibian American who moved to the United States in 2001 to complete her higher education. Yambeka is a term which literally means “ Blessed ” in the Oshiwambo language, spoken by the Ovambo people in the southern African country of Namibia. Yambeka Children was created to promote African literature, languages, and short stories for children. For more info, you can always visit>>http://yambekachildren.com/about.html. Yambeka Children has four main products, Toys, Books, Clothes and Interactive Learning DvDs with African stories. In books section, you can get bi-lingual books, Swahili/English books, Namibian/English. Giving heed to the plea parents did not hesitate to take their children to the Fair... atleast all people attended the fair.